Tyvek Wristbands are reinforced paper (use-once) and are available in White, Blue, Yellow, Orange, Green, Pink, Purple or Red, with black print. Gloss Plastic bands are available in the same colours. Please specify your chosen wristband colour in the order. 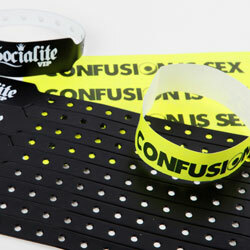 Other print colours, plastic, silicon, re-usable and woven wristbands are also available - please call for a price.